PHOENIX--(BUSINESS WIRE)--The last thing any e-commerce company wants is for someone to break the internet. Even if that someone is Wreck It Ralph, himself. But that’s exactly what he and Vanellope are doing in the highly anticipated Disney movie, “Ralph Breaks the Internet,” hitting theaters on Nov. 21. Carvana (NYSE: CVNA), an online used car retailer, is riding along for an exciting collaboration with the movie. In celebration of their mutual affinity for e-commerce, Carvana and the characters from Disney’s “Ralph Breaks the Internet” are joining forces throughout a multi-channel campaign to highlight just how fun it can be to buy your car online in as little as 10 minutes and have it delivered to your door as soon as the next day. If Ralph and Vanellope can do it, so can you! 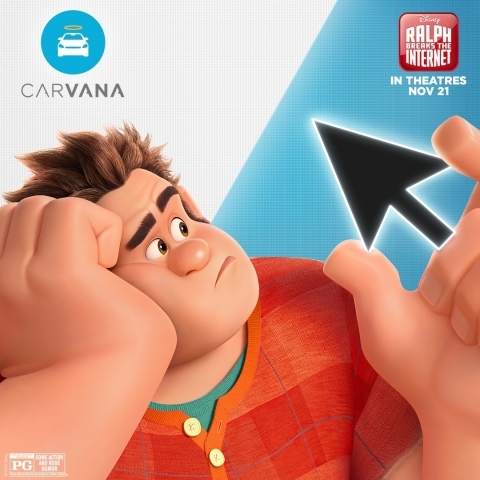 Throughout November, Carvana advertising featuring Disney’s “Ralph Breaks the Internet” will be all over – you guessed it – the internet, as well as TV, out-of-home and digital channels, including Carvana.com. Fans can tag along and see Ralph and Vanellope breeze through the world of online car buying with Carvana and mark their calendars to see the movie, only in theaters on Nov. 21. To celebrate the launch of the campaign, Carvana hosted an online sweepstakes for one lucky winner and a guest to attend Disney’s “Ralph Breaks the Internet” Hollywood premiere in Los Angeles, all expenses paid. Carvana kicked off national TV advertising with a :30 commercial that combines animation and live-action footage, following Ralph and Vanellope as they go on a shopping spree through the internet and wind up with more than they bargained for: https://youtu.be/kATPDJQyKlM. Before the movie is on the big screen, visitors to Carvana.com will be greeted by Ralph on their computers and mobile devices, and will even have the chance to do 360-degree virtual vehicle tours of cars from the movie. Commuters who pass by Carvana’s Car Vending Machines in the Phoenix metro area – where the company is headquartered – and Orlando will also get a glimpse of Ralph, featuring a custom-designed wrap advertising the movie on can’t-miss, all-glass towers. Digital channels, including social media, display ads and third-party listing sites, will encourage fans to see “Ralph Breaks the Internet” on Nov. 21 and buy their next car online. Carvana and the characters from Disney’s “Ralph Breaks the Internet” have teamed up in celebration of their mutual affinity for e-commerce.